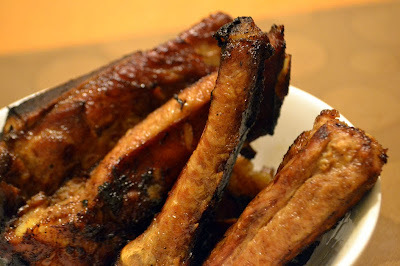 The first time my wife cooked this, I was intrigued merely because the ribs have been cut up into serving pieces. I guess she knew that I prefer the meat to be well done. I love this dish; one simply picks up a piece and gnaw until only the bone remains. The second time she served some I simply had to ask how it was prepared. She said that she simply cut up the ribs and marinate these in store-bought barbecue sauce, mixed with a bit of salt and pepper. Leave to soak for at least a couple of hours (longer is preferred if you have the time), and then deep fry the ribs. To borrow the words of a certain fast food ad, it's simply finger-lickin' good.